The Dow Jones industrial average climbed 2.2 percent in August. Not bad — but not as good as the Standard & Poor’s 500 index, which saw a 3 percent increase. Neither, however, could match New Jersey. 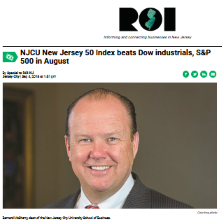 The NJCU New Jersey 50 Index, a fund representing 50 of the largest publicly traded companies in the state, and thus a barometer for the New Jersey economy, jumped 3.2 percent. Since its inception in August 2017, the NJCU New Jersey 50 Index is up 14.3 percent. Officials at the New Jersey City University School of Business have said they created the index as a way to take a snapshot of the New Jersey economy. “New Jersey is home to a wide variety of publicly traded corporations, from huge global pharmaceuticals to technology innovators, consumer goods companies and retailers,” School of Business Dean Bernard McSherry said.